One of the main frustrations when it comes to using Kickstarter has been discovering new projects. In fact, we put together a guide on how to discover the crowd-funded gems 7 Ways To Discover Cool Kickstarter Projects Before Anyone Else 7 Ways To Discover Cool Kickstarter Projects Before Anyone Else It's easier to search for interesting projects on the site. We've come up with a list of seven ways to discover interesting and new projects on Kickstarter before anyone else does. Read More before anyone else, but now Kickstarter itself has finally done something about it. 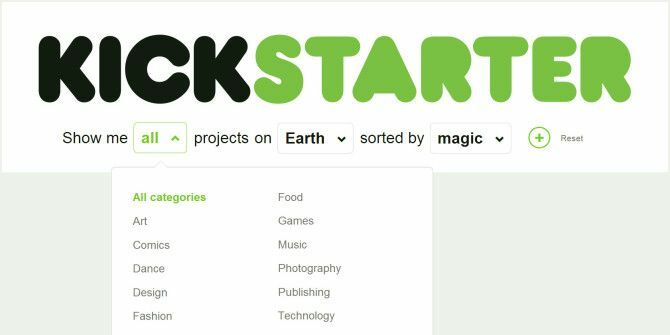 Kickstarter has now introduced an advanced search feature making it easier to drill down into the new projects posted on a daily basis. The new search feature on Kickstarter allows you to filter your search results based on three categories. First, you can filter down by category or location, then decide how you want to sort your results – by popularity, launch date, end date or most funded. Click the little ‘plus’ button and a whole bunch of other filters appear including tags, amounts that have been pledged, crowd-funding goals, percentage raised and more. You can also search for projects that you’ve starred, backed, and that have been backed by friends. The new feature isn’t entirely flawless, but it only has been around for a short time. Searching for the tag ‘photography,’ for example, returns just over 4,000 results, which is a much lower number than expected. This, we imagine, comes down to the fact that Kickstarter users may not be tagging their projects appropriately, but with the new incentive of the advanced search, we’re hoping that this will change. What do you think of Kickstarter’s advanced search feature? Does it fall short of your expectations or has it helped you discover projects you might have missed otherwise? Let us know in the comments.